I’m down in NOLA for the Society of Wine Educators Conference again this year. I had a version of the Muffaletta yesterday and was reminded of this post, which is on of the absolute most widely read on my blog for the last seven years. I like this city – what warmth and great food. Went to Mr. B’s Bistro for dinner and was impressed. Conference as always is a great time to connect with old friends and make new ones and to taste great wines. More of the conference in the coming days. 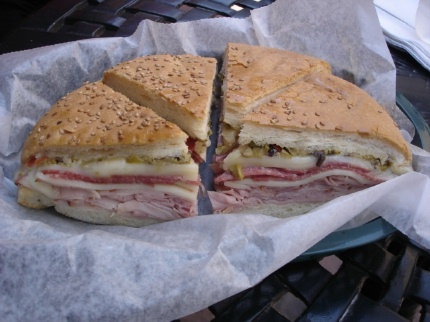 The Muffaletta is a delicious slice of Italy that is an integral part of the Crescent City’s food traditions. Local lore is that the Muffaletta was created at the Italian run Central Grocery on Decatur St in the French Quarter in 1906. The store still sells Muffalettas and many say they are the best in town. The sandwich as you can see is huge and has a variety of cold cuts and cheeses topped with olive salad. While not slimming, it is an incredibly satisfying meal. Sharing is the way to go with this gigantic treat. For a great Muffaletta recipe, check out http://www.gumbopages.com. 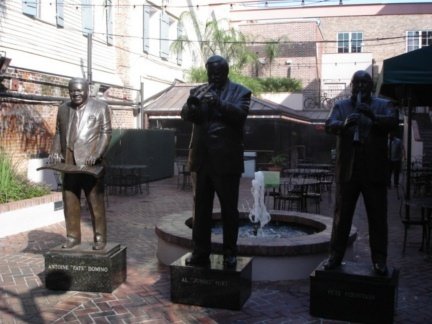 I had my Muffaletta at Cafe Beignet, a nice outdoor location on Bourbon Street in Muscial Legends Park.